Why are Wednesdays always the day I give myself the most chaos? Our dear friends Gracie and L. and their parents are in town, home for a few months on sabbatical, and we’ve finally found some time to have them over for dinner. 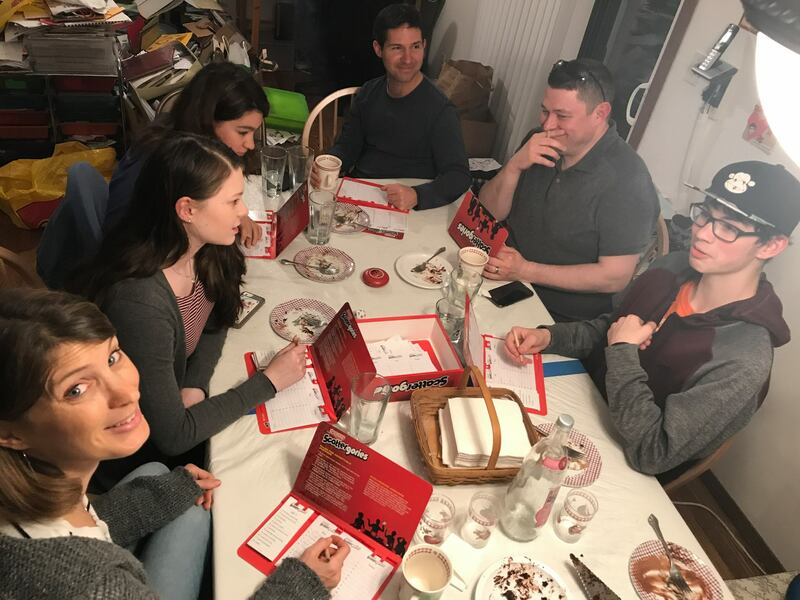 Once dinner was over, Ane suggested a game of Scattergories. Everybody except our boys participated, but everyone was ready for chocolate cake and ice cream, even if people were playing a game. We had a great time (despite the squabbling that the boys insisted on carrying on with), and it just proves that sometimes, chaos works out okay. This entry was posted on Thursday, April 12th, 2018 at 4:34 pm	and is filed under Children, Group o' Friends, Kitchen Work, Vacation Tales.